What if? – Dancing in the rain! You are happiest while you are making the greatest contribution! I like things that make me happy. I am trying to refocus my days on seeing the positive side of things and paying more attention to the little things that make me smile. Some of those things are just so simple that it is silly but I think that is the key. Today at the YMCA a mom was getting her little boy ready for swimming lessons and she encouraged him to pee first to which he of course replied “I don’t have to!” What parent has not heard this? She patiently asked him to try and the minute he sat down he said “Mommy I’m peeing!” The mother laughed and I on the other side of the door laughed to myself. Around the corner came another Mom and child, same scenario! Double smile! After leaving the YMCA I was having coffee with my friend and she is so incredibly positive that she always makes me smile. We were having a conversation about yesterday’s newspaper and how depressing it was. I recounted to her a story about a random attack on a man at the Churchill LRT station where he was assaulted and thrown on the track by three men. He got up and was thrown back down. My wise friend questioned me about the details getting to the part where some onlookers helped the man and detained the attackers until police arrived. She said imagine the difference in that article if it was written focusing on the kindness and bravery of the onlookers who helped the victim instead of focusing on the attack. What if the Media focused on the positive aspects or outcomes of the story? How different would the effect be? If I had read an article about strangers banding together to help a man in need I most likely would have felt differently. Interesting way to look at things. WHAT IF WE FOCUSED ON THE POSITIVE, HOW DIFFERENT WOULD OUR LIVES BE? I have always loved inspirational sayings, words of encouragement and kindness, cards or notes that brighten your day. The best is when you get a note when there is no occasion; someone was just thinking of you and wanted to say hi. Now that most of us are so technologically savvy notes and kind words can come in so many forms, an email, a facebook message, a wall post, a tweet, a kind word on an instagram post or a text (I am sure there are lots more). Random phone calls are great too. Sometimes in the middle of the night I get drunken party phone calls from some special friends back home. If I am not up to get the phone call I love listening to the messages and knowing that in the middle of their great time that they took time out to think of me and make me part of their party. *Hugs to you, you know who you are! Yesterday I got a Facebook request from an old friend back home that I haven’t seen in many many years. When I accepted the request he wrote a note on my timeline inquiring as to how I was. That small thing makes me happy. I get random friend requests from people who may or may not say hello to me if they ran into me at the mall so I think it shows wonderful facebook etiquette to send a short note to the person you are friend requesting. So thank you Mike Swan, you have great manners! I have been very blessed to have met a remarkable young lady who shares my adoration of kind cards and notes and she has taken this passion of hers, spun it through a tornado of optimism and love and has come up with an extraordinary project called Love Letters to Strangers. Ashley Green is spreading the love around one kind love note at a time. From the first time I met Ashley I felt like I had known her for ever, or maybe I just wished I did. I admired her and the enthusiasm that makes you want to share in the cheerfulness that surrounds her. She radiates warmth like a mug of hot chocolate on a cold winter’s day. When I found out about her project Love Letters to Strangers I thought it was wonderful and sweet. As I learned more and more and followed her little project through social media and her blogs I thought how selfless and genius she is. Most people talk about wanting to make the world a better place but Ashley is not afraid to take that extra step to make it happen. On Friday I took my girls; Haley 8 and Morgan 13 to a Love Letters to Strangers Workshop at the Stanley Milner Library downtown. I walked in thinking I would need to direct my kids as I wasn’t sure what they knew about the project beyond what I had told them. The room was toasty and the smell of homemade apple cider was slightly intoxicating. There were two tables adorned with different types of chocolate bark and one table had writing supplies and colored blank cards while the other had decorating supplies such as paint, markers and stickers. The girls just sat down at the writing table and started writing. I tried to offer some advice but they were adamant that they knew what they were doing. Haley surprised me the most!! 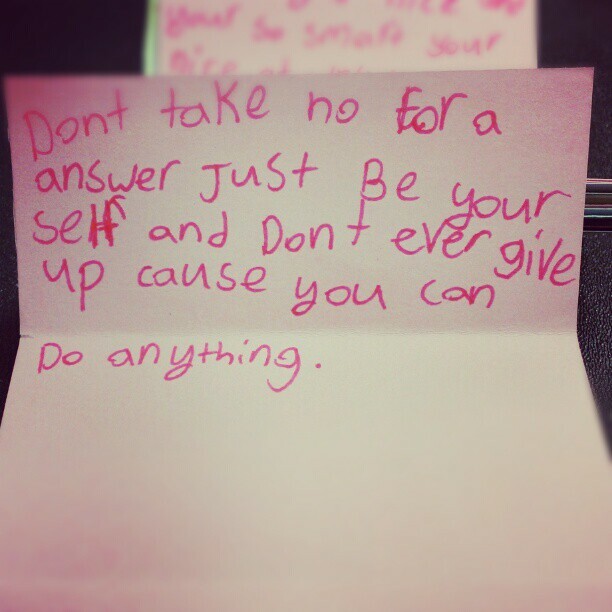 Without coaxing or encouragement Haley made 31 inspirational cards with words and thoughts straight from her heart. During the course of the workshop Ashley read us some emails that people have sent to her since she began the project and they were all very positive and at least one evoked such strong emotions that several of us at the tables were brought to tears. The mood in the room was not that of sitting in a roomful of strangers, it was more like sitting in a room with friends you just met. The instructions were quite simple, write a letter to a stranger, to you or someone you know. The underlying message was to share kindness, wisdom, encouragement and love! Some people take their cards with them and others who are shy about giving a note to a stranger leave them to Ashley who is more them happy to give them out. Over 440 cards were made that evening. Haley made 31, Morgan 30 and I made 26. It is kind of addictive. We sat down and imagined the type of people that we would encounter during our days and made cards of encouragement and kindness. It was a nice evening and we left with all of our cards feeling very good about ourselves and feeling proud to have been a part of such a movement. A movement towards kindness. In our daily lives we often don’t take the time to be kind to the people we know let alone strangers we meet on the street so it became a challenge for us to see how many opportunities we would actually get to share our cards full of wisdom and inspiration. To add to the mystique of the winters evening there was a whisper of a snowfall as we walked outside and the downtown lights were glowing under the moonlight. On the short, cool walk back to the truck the girls thanked me profusely for allowing them to be part of the Love Letters to Strangers, an event that cost us nothing but our time and our words. You’re welcome. At home the kids excitably piled and re-piled their stacks of love letters, read and re-read and complimented each others niceties. Our first trip out the next day was to the Castledowns YMCA. We each had some random cards with us and I left the remainder in the dash of my truck for easy access. Haley was leaving the dressing room and decided to give an encouraging letter to a woman who was on her way out. Eight year old Haley passed the woman a letter saying “You are perfect so always be yourself!” It never occurred to Haley to feel any sort of trepidation or embarrassment about handing a handwritten note to a stranger. The letter was folded in two and was decorated with paint and stickers and the love letters to strangers URL was stamped on the back (LoveLetters@Strangers.com). The lady timidly accepted the letter with a half smile said thank you and walked away. Haley told her to have a great day and the ladies reaction, though not overly enthusiastic was enough! The lady came back a couple of minutes later after reading the letter and said thank you to Haley and told her to have a great day. Haley gave me a warm knowing smile. What are strangers? Perhaps just friends you haven’t met yet!! Previous postI love you more than mashed potatoes!!! Oh Michelle! You can make me cry by writing the happiest stories. You have such a way with words, and you are teaching your beautiful girls how to be just as awesome as you are! Love and miss you! I come from good people 🙂 Love you!